Around Halloween, I always like to pick up a creepy story or two. 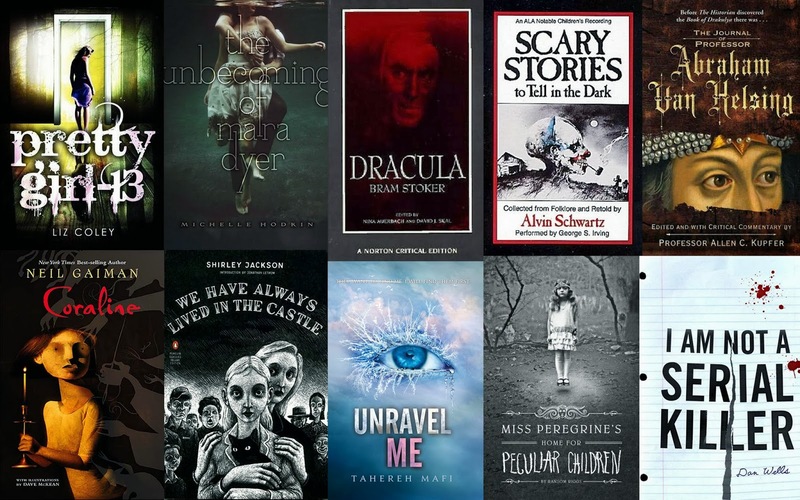 This week’s theme is scary book covers, but I have combined it with some of my favorite creepy stories, because what would one be without the other? Linking up with The Broke and the Bookish. Pretty Girl -13 by Liz Coley– The creepy story of a young girl who was kidnapped and held hostage for many years. She eventually finds her way home, but she is broken and fractured and not sure how to put her life back together with everything she went through. This book and cover is one that held my rapt attention because of the dark plot. The Unbecoming of Mara Dyer by Michelle Hodkin– This book is a little bit horror, a little bit romance and the perfect combination. I was completely drawn into this story and Mara’s life and gift. I love how much of her family life is included in the story and her relationship with Noah is one of my favorites. I love the creepy cover with the main character’s heads barely above water. Dracula by Bram Stoker – Perhaps the original haunted thriller, Dracula is still as good today as it was when it was written in 1897. What we know of Dracula from popular culture is very different from the Dracula of Bram Stoker’s masterpiece – and his Dracula is far more terrifying. The characters are brilliant and the storyline is rich and compelling. A must-read, especially for anyone into classic literature. Scary Stories To Tell in the Dark by Alvin Schwartz– This collection of short stories and its cover has freaked me out since I was a child. One story in particular was the stuff my childhood nightmares were made of. The Journal of Abraham Van Helsing – Perhaps the most unsettling book I’ve ever read, this book plays itself as the real journal of Abraham Van Helsing, the famous vampire-hunter character in Bram Stoker’s Dracula. While this book is fictional, you would have a hard time guessing it from the way it’s written. It reads and feels like the real deal and gives glimpses into the deeper world of vampirism and its history throughout the world. This is a must-read if you want to stay up at night, even the cover will keep you up. Coraline by Neil Gaiman – This creepy, but fun book is geared more towards children, but is fascinating enough to hold the interest of adults too. I love the story and knowing the story makes the cover seem even more creepy. We Have Always Lived in the Castle by Shirley Jackson– Is there such thing as a horror fairytale? We Have Always Lived in the Castle is the story of an ostracized family living in their big house in a small town, ostracized because at family dinner one night, four people didn’t make it out alive. Only two sisters and a uncle remain, living secluded lives. One of the sisters is arrested but eventually acquitted of the murders, but that doesn’t change the fact that the entire town thinks she did it. This story is kind of oddball, told from the perspective of the slightly unhinged younger sister. It is thought provoking and creepy, perfect for an October read. This creepy cover represents this book so well. Unravel Me by Taherh Mafi– One touch can kill you. For some reason, touching Juliette is fatal. Her parents cursed her and the government has locked her up, until they realize she might just be the perfect weapon. Now Juliette has a choice, destroy or fight. It was interesting, with some twists and turns without getting completely off track. It was a read straight through kind of book. It isn’t necessarily scary, but I love the image on the cover. Miss Peregrine’s Home For Peculiar Children by Ransom Riggs– Jacob makes the journey to Cairnholm near Wales, to visit the orphanage where his grandfather grew up to discover it was bombed out during the last World War. How can that be? His grandfather received a letter from the Headmistress, just a few years ago. It is a mystery that Jacob is determined to solve. I really liked this book. It is the first book in a series, but I felt like it was fun and intriguing and I love where the story headed. This book isn’t particularly scary, but the real old photographs the author used throughout the book really gave it an eerie feel. The picture on the cover is one of my favorites. I Am Not A Serial Killer by Dan Wells – What would you do if you thought you had the potential to be a serial killer? John Cleaver knows he has the potential to be very dangerous and so he has created a list of rules to keep himself in check, until he meets someone who is even more dangerous than him. I love this story and the cover, it is simple but very telling. The Scary Stories books gave me nightmares, even now. The art and the covers paired with the retellings….just terrifying. I've been wanting to read We have Always Lived in the Castle. I like the title…it sounds attractive. The premise is intriguing and I really like this cover, very pretty. It looks like a gothic cover of a children's book, but if I'm not mistaken it its is adult fiction. Great choices. I have Miss Peregine's Home for Peculiar Children on my list this week too. Creepy children…not good! I was thinking today about the Shatter Me series. I should have put Ignite Me on my list as it scares me as to what is inside. What a great selection. All of these books are definitely going to scare the reader. "I Am Not a Serial Killer" wigged me out. And it takes a lot to do that. I think because he was young. Great list, Coralina is on my list as well! Scary Stories to Tell in the Dark have some seriously creepy illustrations, too! I love to show them to kids when the come into the library (I'm a librarian). I haven't read Miss Peregrine, but I want to. And those old photographs are creepy. I keep hearing that it isn't realyl scary, though.